WE STARTED THIS FUND TO HELP OUR FRIENDS AND NEIGHBORS THE BRODERICKS, BELOW IS CRAIGS STORY FROM THE FAMILY. 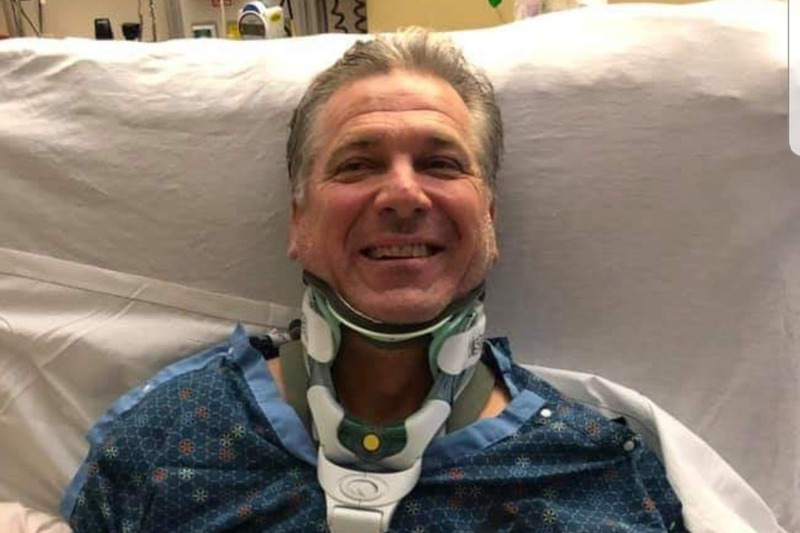 On January 22nd 2019 our beloved husband, father, grandfather friend and partner in Brody’s Burgers & Beer had a horrific ski accident in Alta Utah. A skier abruptly stopped in front of Brody and he had to avoid him. Brody was pitched off a 15 ft cliff and landed on a his head on a bed of rocks. Brody’s Marker helmet saved his life. A group of skiers looking to jump into Eddies High skied down to him and found Brody blue and non-responsive. One of them cleared his airway and called for help. The ski patrolman who arrived on scene is also a fireman/paramedic. The Dr. from the Alta ski clinic was skiing that day and heard the call. The team strapped Brody onto the toboggan and removed him from some of the most dangerous terrain on the mountain and 3 feet of fresh snow. They had him on life flight within 45 minutes. The nurse on life flight drilled an IV into his shoulder. The boys and I rushed to Utah to be by his side. Walking into ICU we found the hero of our lives strapped to a bed with the breathing tube down his throat, due to biting his tongue nearly clear through when he landed. Brody had tingling sensation throughout his whole body but was unable to move any of his extremities. We were told he had fractured his C3 & C4 and had ruptured T6-T9. The head CT showed zero head trauma and his organs appeared to all be functioning. Under Preliminary evaluation he appeared to have no other fractures. There were three of us and the unit, while very strict, made an exception and allowed the three of us to stay by his side. To be honest from the time we arrived to the next morning when the rest of his inner circle arrived it was all a terrifying blur. 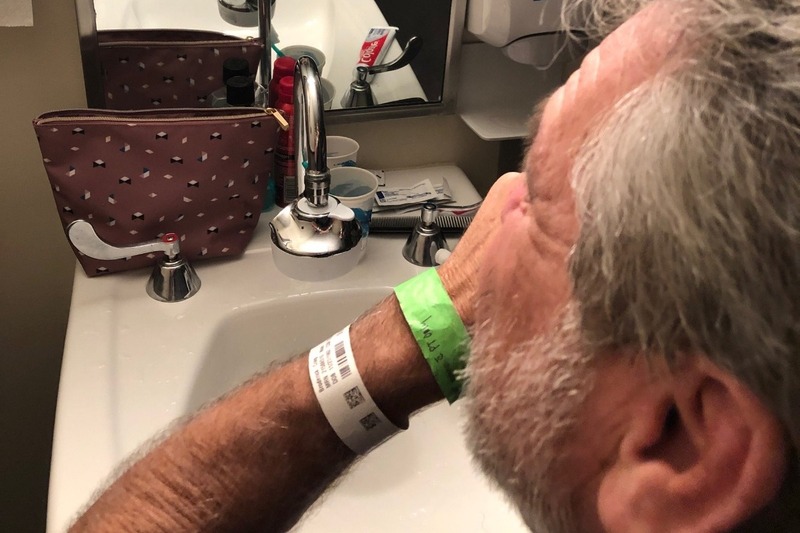 The neurosurgeon told us the only course of action was to raise his blood pressure in the hopes it would some how circulate through the contusion on his spinal cord and keep it alive. 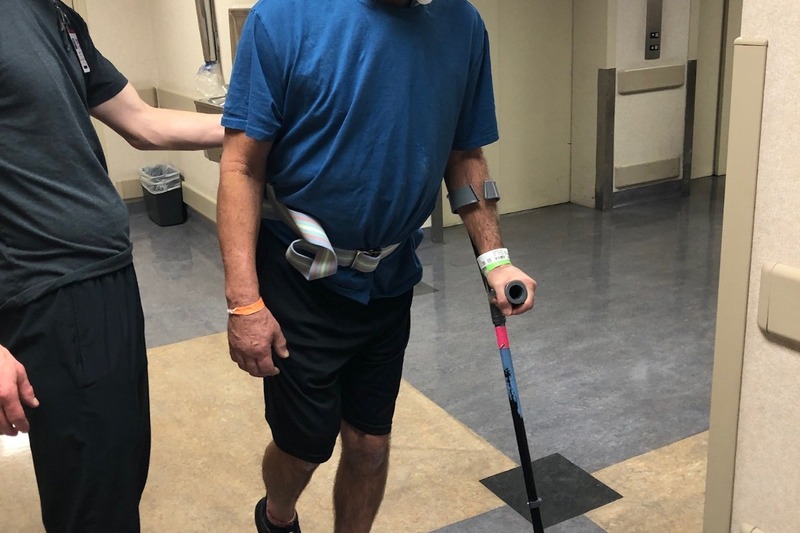 His Spinal cord was intact so he had a chance at regaining some type of movement once the swelling started to decrease. We were told that the swelling usually peaked within 72 hours. So began the dangerous dance of raising his blood pressure yet keeping him some what sedated and calm. I tried lovingly to cue him on his yoga breath. Tried to get him to visualize our instructor on top of Mt. Helix talking him through our meditation. This would work, but not for 72 hours. We were now a team of six and our only job was to keep Brody calm until there was any sign that the swelling was going down. They had removed the breathing tube Wednesday afternoon but warned us it would go back in if he required surgery. Breathing tube out, 1st huge hurtle completed. Wednesday evening he began to show slight movement in his left foot and arm but none in his fingers or toes. There was still no movement on his right side. The motto of the day would be, “cautiously optimistic.”That was what the Neuro surgeon told us and it stuck in my mind like glue! We stood vigil over Brody and there would be moments of new movement that would carry all of us a tiny step forward mentally. On Friday we were told by one of the Nuero surgeons that the medication they were using to raise his blood pressure could,”damage his heart and lungs and make his fingers and toes fall off!” His actual words to his patient. This was the first and only negative experience he had received since he had fallen. The care he is receiving and the compassion and dedication from these professionals at University of Utah Hospital is truly awe inspiring. Brody was moved out of ICU in the early hours of Saturday morning. PT and OT continues to work with him daily. Everyone is in amazement at his inner strength and his appreciative attitude towards every single staff member. We were told that his progress is on an upward trajectory and at some point will plateau. As the hours tick by and the days run together the Broderick family can actually feel in our hearts the love and support from our incredible Brody’s family and customers and of course all of our family and friends. On Tuesday they discovered blood clots in his right leg. Brody has had minimal movement on his right side and the clot created an urgent scenario for the day. He would need a procedure ASAP because the clot was growing quickly and appeared to be moving toward his heart and lungs. He had to lie as still as possible until he had a filter placed up through his groin and placed into his main artery next to his heart. We were told about the clot at 8 am and they were not able to put the filter in until 7:20 pm. For me, this was the most terrifying day yet! The procedure was a success and his recovery was back on track yesterday January 30th. The Broderick Family. It has taken me some time to set my ego and pride aside and open my self up to accepting any and all help people would like to give. We would like to thank our amazing staff for keeping Brody’s up and running. You are incredible! We are living one day at a time and hope to return home to all of you soon. Brody is determined to not only walk again but has made plans with some of the staff members to return and ski with them next season. Craig has had an up and down week but with hard work and determination small gains are made. The goal this coming week is to be able to walk on his own with a crutch, if this happens he can come home. Once home the therapy and recovery will be just as intense but at least he will be home. The entire family is overwhelmed and so thankful for the love and support they have received from this community. Just three weeks ago Craig could not move anything below his neck. Today he is walking with a cane and improving daily. There is still a long way to go and Craig is putting everything he has into his rehabilitation. Craig and family are humbled and overwhelmed by your support and love sent!! THANK YOU! The GoFundMe account reached it's initial goal which is a testament to our community and the impact the Brodericks have on everyone, we cannot thank you enough. There is still a long road ahead and your continued support is critical. Craig wants to donate to the Adaptive Skiing Program, hopefully we will have that option but it is too soon to tell. Craig wanted this posted. THANK YOU ALL!!! Craig wanted this posted.... THANK YOU ALL!! !